Most people who have a regular job during the day, end up taking jobs that they can do in the evening or the night. If you are a night owl, you do not need to spend all your time flipping through channels on late night TV. You can actually spend your time in a more constructive way and make some money while at it. Here are 21 jobs flexible enough for you! I also suggest the highly recommended career site FlexJobs, which has an A+ rating with the Better Business Bureau. FlexJobs has a money-back policy whenever you are not contented with their service. They also ensure that every single career opportunity posted on their website is 100% legitimate. #1 – Working Solutions -(Read Working Solutions Review )- This company offers work at home opportunities in various fields. Previous call center experience is a plus. Day and night shifts are available. #2 – 3 Play Media – (Read 3 Play Media Review )- You will need to commit to working a minimum of 15 hours each week, whether during the day or night. The job involves editing transcripts from home. #3 – Uhaul (Read Uhaul Review ) This very well-known company hires people to work as Customer Service Agents. You will need to work anytime from 4 am clear through to 5 pm. The hours are flexible so you can pick and choose. I do recommend purchasing a good quality headset for taking phone calls. #4 – GoGokids – This company offers flexible part-time jobs teaching English from home. Most workers average between $14-$25 per hour. #5 – Appen Butler Hill – You must commit to working for this company at least 20 hours each week. However, you are allowed all the flexibility you need. #6 – Fancy Hands – Read Review – Fancy Hands hires Virtual Assistants who run all the basic errands for the business professional. The job can include proofreading documents, researching information online, booking a limo or making dinner plans. #7 – USA Contact Point – They hire Customer Service Agents who are interested to work from home. You would be responding to some of the questions asked by their clients regarding their products and services. You May Like: 22 Real Online Survey Jobs That Pay Cash for Taking Surveys Online. It’s completely FREE. #8 – Isus – hires online trainers to teach English on their web-based platform. You would teach English over the phone and then give feedback to the student. In addition, you would also monitor the student’s progress. #9 – Advanis – This Canadian company hires people to carry out market research. You get paid training while you work from home in the evening hours. You do need to have a land-line telephone. #10 – Liveops – Read Review – You would be hired as a Call Center Agent for this company working from home. They do not employ you but you become an independent contractor. You, however, need to have $65 ready for the cost of both a credit and background check. #12 – Rev – If you join Rev you will be working either as a Translator, a Transcriptionist or both. They are currently hiring a new team of Transcriptionists who can do a good job and take pride in delivering high-quality work. I recommend checking out Janet’s FREE 4-day transcription course to help you turn your passion into a full-time career. #13 – Modsquad – Read Review – This company hires online moderators to work from home. Your role involves moderating social media activity. This is a worldwide opportunity. #14 – Smart Crowd– Read Review – This company hires online data entry keyers to complete various typing tasks from home. You will be able to log in whenever you are available and complete as much work as you can manage. US only. #15 – Clickworker – You will have the flexibility to work whichever hours you prefer. The tasks include web search, editing, data entry, writing, and translation, among others. The pay starts at about $9 per hour. #17 – Cha Cha – This is a service where answers are provided. You would be hired to provide answers on their website or even using your phone through their mobile apps in real time to questions asked online. #18 – Reasoning Mind – This is a tutoring company where tutoring sessions are conducting through Skype. You will be able to teach students virtually and earn some cash in the process. #19 – Voice log – Read Review – You would be hired as a Live Operator to work from home. The hours you choose to work are entirely up to you. #20 – Scribie – This company hires Transcriptionists to work from home. Pay is $10 for each audio hour. I recommend Janet's FREE 4-day transcription course to help you turn your passion into a full-time career. #21 – ORC International – The job entails carrying out telephone research interviews where you would be conducting interviews on behalf of fortune 500 companies. The hours are flexible and the pay is $8.75 an hour. #22 – Writersdomain.net – You need to be a great writer to work for this company and your work needs to be 100 percent original. They have a star rating for all articles provided. The standard three-star articles pay $15 while those that are above average can earn as much as $17.50. #23 – Liveworld – You can work remotely in your own time. The job entails moderating forums online. Need More Late Night/ Evening Work from Home Jobs? Haven’t found the right opportunity from the jobs I've shared above? Visit FlexJobs now. This site has been rated by Better Business Bureau with A+. They also offer a money-back policy if you are not contented their service. FlexJobs assures that their listing is hand-screened to make sure the legitimacy of each job. Searching for legitimate work from home jobs without the worries of being scammed is possible with FlexJobs! Extra Cash Idea: Earn extra cash by scanning your grocery receipts with Ibotta. This is completely free. I withdrew $1,124.19 (on 9/30/17) thru my PayPal account in just a few minutes. P.S. Enjoyed this content? Please subscribe to work from home job lists found on Facebook and YouTube for FREE! I offer tons of listing for work from home opportunities, job leads, and video tutorials every week. Hi! I used to work for MyTime, they let go of all their American workers and no longer offer work from home :). I know of a few Americans that did not get paid, as well as all of their Filipino remote workers did not get paid. They now have a call center in Jamaica, somewhere in Kingston. Thanks so much for including 3Play on your list! We just want to clarify that people do NOT need to commit to working a set number of hours a week. As a contractor, they can do as much or as little work as they want each day/week/month that fits into their schedule (or even do none for a while if they don’t have time). So people should feel free to apply even if they aren’t able to commit to a certain amount of hours each week. Thanks again for the mention! Alorica at Home there asking for a fee of 29.00 is that good? What are they saying the fee is for? A background check? Hi, lashay, I’m a us citizen living in Dominican republic can you recommend me any job a can work from DR? Hi, Vic! 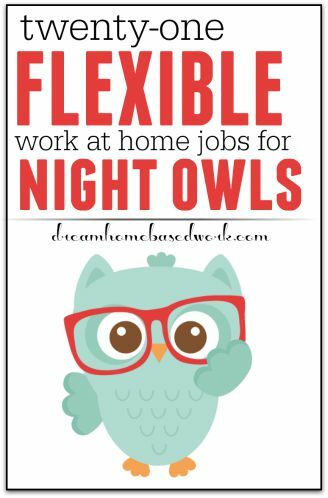 I recommend checking out these nationwide jobs https://www.dreamhomebasedwork.com/hiring-for-work-at-home-nationwide/. Hope this is a start! Hi Kim! There are several other companies like Scribie, REV, and Quicktate. Very good resources for those looking for work at night. I’m not a night owl, but I do have nights that I can’t sleep due to steroids. On nights like this I work on my work from home opportunity. I am just getting started with them, and I am interested to see how much I will make with this. I work for a company called Nexusop.com they are great to work with they offer you flexibility which makes life so much easier for me. The training wasn’t hard at all you could stop and start when you needed without being forced to sit in virtual classrooms. I would recommend to anyone. Another company that’s not on this list that I’d reccomend is Nexus Op! I recently started working with them and have found them to be a perfect source of income as a full time student, since my school schedule tends to be unpredictable. They pay by the minute during each call you accept, and the better your rating is, the more calls you can accept. They pay quickly too via direct deposit! Highly reccomended! Hi Lashay I am looking for a Part-time work at home evenings only position could you please help me I have been looking for months with no luck. I have had promises but after I went threw the time consuming process it was all days even after I specified from the beginning evenings only. Please Help!!! Hi Mary! 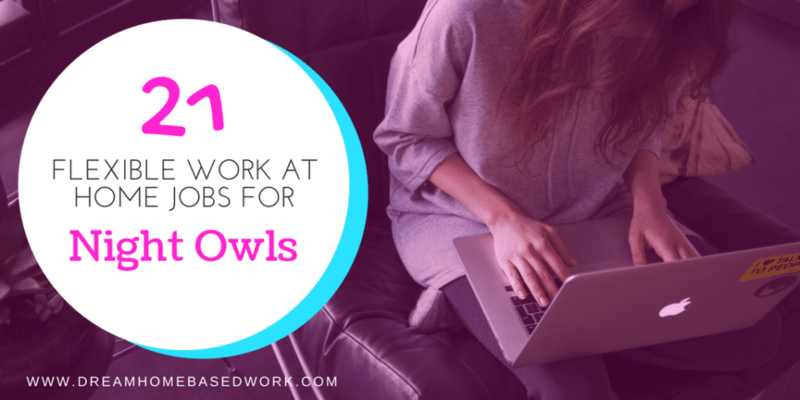 I do have a list of options here for part-time work – https://www.dreamhomebasedwork.com/part-time-work-at-home-jobs/ What other work experience do you have? Hi Kia! I really appreciate your feedback:-) I would suggest companies like Arise, ACD Direct, and Great Virtual Works. These are awesome but do any of them require international employees? I live in South Africa and this type of thing is very rare to find here, there isn’t that much flexibility to work from home yet. Hi Christine! I recommend checking out this list of companies for international work https://www.dreamhomebasedwork.com/international-work-at-home-jobs/. Hope this helps! This is a great list with a bunch of different options, but I just wanted to tell about my experience with some. Writing – Basically anything that is a database of writers pays horribly in comparison of you going out and approaching sites yourself. A site might pay one of these networks like 100 bucks, then they pay you like 20 (which is actually a lot for this route), or you could find the site yourself, offer your story, and walk away with 250 bucks. Of course the networks are a good way to start though. ChaCha – Wouldn’t ever do that again. I spent hours a day answering questions and doing research for it. I was answering probably 100’s of questions an hour, never broke 100 bucks. Their pay was I think .05 cents an answer when I worked there, and you only got that if you answer fast…. Otherwise you’d get like .03. Virtual Bee- These sites are purely supplemental income. You will make a little more than ChaCha, but it will also dip dramatically all the time too. One day you could be working your tail off, the next day not a single job comes in. Thanks for sharing your personal experience with these three options. You are very welcome! Can you share more about your experience with Scribie? Scribie.com is a site where you can sign to do freelance general transcription. First you have to sign up with your email. There is waiting list, so you may have to wait for a while to be accepted and receive your first transcription gig. Keep in mind that there is an exam you should pass. Hi Lashay. I’m a child of the Most High God too, and a single mom of one teenage con. I am looking for a way to work from home and I was very glad to find your website, but even more please that you are my Sister in Christ Jesus. Great job! I love this website! Excellent work!